Cannas are a favourite plant in the border and are readily available for sale from online nurseries in the UK. Often refered to as Canna Lilies for the 'Lily Like' flower, they grow from a rhizome rather than a true bulb. Easy to grow and both Canna Flowers and Canna foliage can be colourful. Canna Lily rhizomes or bulbs can be ordered by mail for planting in late winter early spring. 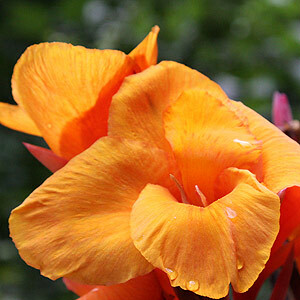 Grown for the foliage as well as the flowers, Cannas add a tropical touch to the garden and are not difficult to grow. The traditional green foliage and either yellow or red flowers of the canna has now been surpassed by many modern cultivars and new introductions. Foliage varies from purple and reds through to bronze and striped and flower colors are varied and multi coloured from white, yellow and pale pinks to reds and multicoloured. Cannas come in 3 main sizes, the new dwarf or miniature cannas, which will reach less than 1m, mid sixes and then the tall cultivars with exotic broad foliage. You can also find cannas that will grow in water usually C. glauca cultivars. You can buy cannas as potted plants, as plantlets or cut rhizomes. And yes you can grow cannas from seed if you wish to. However seed grown plants may not give you the foliage and flower color you are looking for. Cannas grow well in the garden in a sunny position in a humus rich well drained soil. They also work well in pots or containers although taller growing species and cultivars will need large container as they can be a little 'top heavy'. In colder areas cannas may need to lifted in winter, they can be dug as a large clump and store 'as is' to be divide and replanted in spring. Canna 'cleopatra' is the canna you would choose if you could only have one type, because it itself is more than one colour, both in foliage and flower colour. This is an 'old cultivar' the flowers are usually an attractive yellow with red flecks, and plain green foliage, however if may also decide to put out plainer or part red flowers and even change foliage colour to include red markings. This canna will reach around 1.1m (4ft) depending on conditions. Full sun in the UK. Well drained yet moist soil. In colder areas start indoors in pots, and plant out after the frost are gone. Protect over winter if left in the ground by cu tting back and covering with mulch. 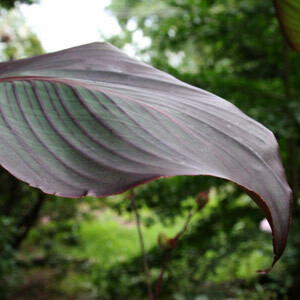 Canna Plants are available for sale from the following nurseries and suppliers. Supplying hardy, half-hardy & conservatory plants including Palms, Tree ferns, Succulents, Bamboo, Aroids, Banana's, Canna, Gingers, Grasses. Includes: Canna picasso, canna irridiflora, canna gnom, canna flaccida, canna purpurea and others. Wide range of spring flowering bulbs, summer bulbs, and snowdrops and bluebells "in the green". Mail order suppliers of Canna plants. Seeds and rhizomes.